Spend one day on the IS® 2100Z zero-turn and you'll discover how our patented suspension technology turns slow, bumpy mowing into riding comfort and enhanced productivity. With Ferris iCD™ engineering under the mower deck, you'll enjoy consistently accurate cutting performance. The machine is an aggressive performer for pros or discerning homeowners. FOOT-OPERATED DECK LIFT: Foot-operated deck lift, with adjustable pedal, can change cut height in 0.25 in. increments from 1.75 - 5 inches. PATENTED LAWN MOWER SUSPENSION: Suspension system consists of adjustable rear coil-over-shocks (shown) and front independent adjustable coil-over-shocks. 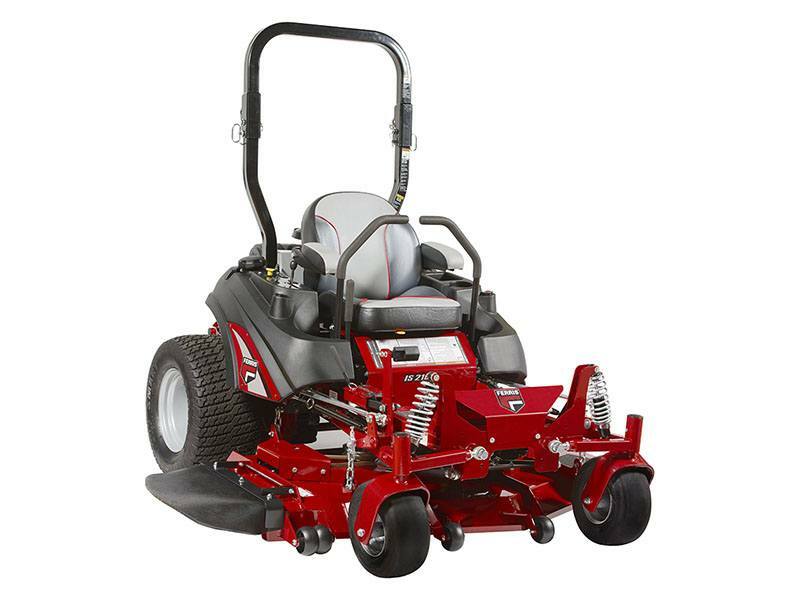 INTEGRATED LAWN MOWER TRANSMISSION: Fully serviceable commercial Hydro-Gear® ZT-4400™ transaxles deliver power and durability. iCD™ CUTTING SYSTEM: Innovative iCD™ Cutting System was engineered to produce the best possible cut in a multitude of conditions. SPINDLES: Features cast-iron greaseable (61 in. model) or aluminum greaseable (52 in. model) spindles. FLIP-UP SEAT: Flip-up seat provides easy access to serviceable components. Belt and blade part numbers are referenced under seat. RIDE-ON MOWER WARRANTIES: Coil-over-shocks and all suspension-related components are covered for 4 years (48 months) unlimited hours. We are committed to providing performance, productivity and durability. Deflector Down - 78 in. Deflector Up - 61.5 in. Balance of Machine - 4-Year limited (48 months) or 500 hours, whichever occurs first.